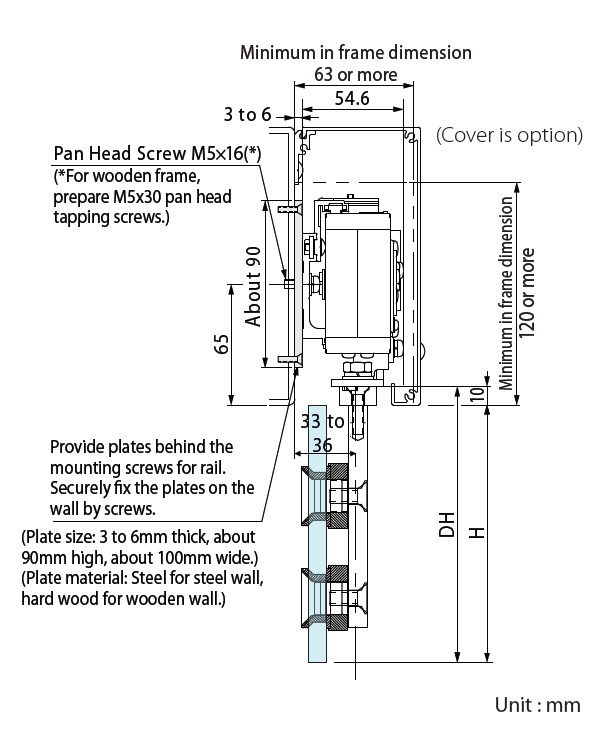 Sliding Door Closer - NSC-G Series - Kenwa Trading Corporation, a specialist in door hardware and various door closing solutions. 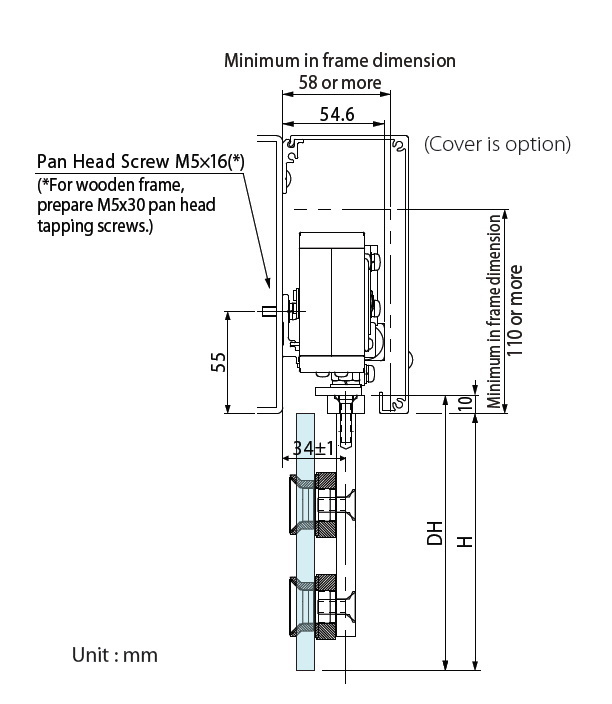 The NSC-G series Sliding Door Closer is an innovative solution adding self-closing feature to your glass sliding door. By utilizing highly durable pull spring device, the NSC-G series offers full-range self-closing function. The door closes automatically from any position you release the door to the complete close position. The rotary gear damper provides safe and smooth soft-close feature at the end of door closure. Both the self-closing speed and soft-closing speed are individually adjustable. Its compact size and functional design allows any sliding doors to become self closing. Designed for door panels of either single, bi-parting and telescopic configuration. NSC-G series is a highly reliable system securely tested for 500,000(NSC-C60V-G) and 1,000,000(NSC-C48-G) cycles. A long lasting product life time is achieved by our cutting-edge technologies, employed in our compact yet robust rotary gear damper, fluid friction resistance and one-way clutch brake mechanism. The only preparation needed before installation is to drill screw holes into the door frame and glass. After that, all parts/devices can be installed by a screwdriver from the front, easily and efficiently. 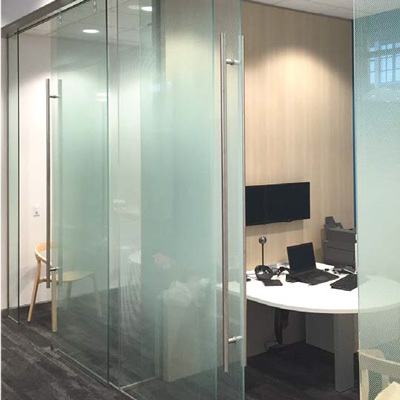 The system can be used for both left and right hand sliding doors. It can be easily converted between left and right handing by a simple adjustment procedure. The system does not require electric power so that works anytime even during power outage. With its unique fluid reduction gear mechanism, the system is also designed to assist in reducing the door opening resistance to achieve an easy and safe opening operation for all, including the elderly, small children, people of limited mobility and people who are otherwise carrying large packages or groceries. (1)system includes pull spring device, rotary gear damper, control gear rack, hangers(x2), door stopper, hold-open device, glass brackets(x2) and rail. Rail can be cut to preferred length. Please choose the glass thickness (10mm=3/8” or 12mm=1/2”) when ordering. Make sure that the wall/frame where the system will be installed have enough strength/stability to be able to hold the entire weight of the door and sliding door closer. 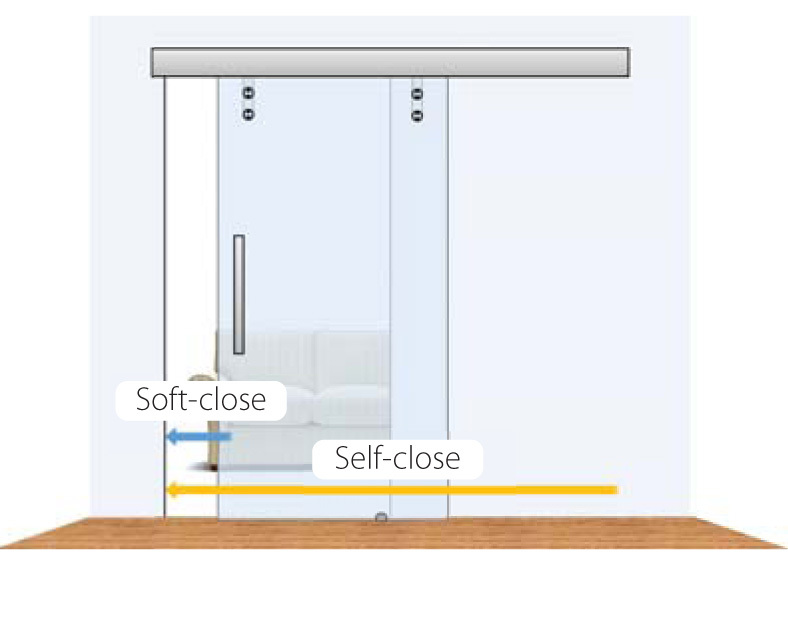 Please prepare a suitable bottom guide for the glass door in order to avoid the door swinging. Please also prepare a floor door stop at front end of the door if necessary.